After a solid 3 years of journeys back and forward to work my trusty Cyclamatic electric bike finally gave up, first of all late last year the battery failed to keep a charge and then around Christmas the motor just ceased and stopped working. As it’s my only way of getting to work and I hate having to wait around for the bus which doesn’t turn up it was time to hunt out a new replacement bike. Originally I was planning on just getting a new Cyclamatic but seeing as the prices have gone up a little since I purchased mine I fancied a change. I also liked the possibility of having some other extras and at the end of the day I different gadget to play with. Some of the extras I wanted the bike to have this time included built in Lights which run from the battery, disc brakes, some form of luggage carrrying capabilities and a slightly more powerful hill climbing ability. 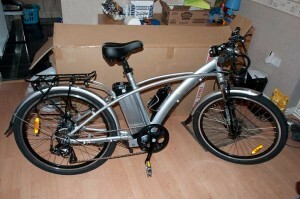 After looking around the Electric bike scene I narrowed my choices down to just a few and having a look at as many customers reviews and as much feedback as I could I decided a Juicy Bike Sport fitted the specification I wanted. In January the Juicy Bike company had a 10% discount offer which I found on facebook by chance, but unfortunately I wasn’t going to be able to purchase it until February. I sent a quick message to them on facebook and they kindly agreed to give me the discount in February. This was certainly a good start. I placed my order a few weeks later and received my bike in about 7 days, Which I think is the usual turnaround to get you your bike. The company has several bike shops selling their range across the country including their own shops in Buxton and New Mills. 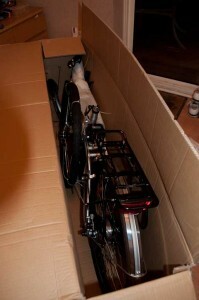 Anyway, When the bike arrived it was well packed in a huge box and I couldn’t wait to get it out and build the thing. The first thing I noticed even before opening the box was that the bike was a little lighter than my old Cyclamatic. I hadn’t really thought about the weight but anything which helps make it easy to manouver is a bonus. I carefully removed everything from the box and hunted around for the build instructions, I found a little manual which I assumed would include full instructions. My Cyclamatic had complete full step by step instructions which related completely to that bike but the manual which came with this bike seemed to be mostly a generic build manual covering a large range of bikes, None of which looked exactly the same as mine. I was quite dissapointed as I wanted to just follow step by step instructions to make sure I did it right. I actually found a more useful user guide on building the bike on the Juicy Bike web site, this wouldn’t be very good unless you had the internet on a laptop or something. I’m not sure if I was supposed to receive a copy of this manual rather than the one I got. Maybe it was just a mistake. carefully removed everything from the box and hunted around for the build instructions, I found a little manual which I assumed would include full instructions. My Cyclamatic had complete full step by step instructions which related completely to that bike but the manual which came with this bike seemed to be mostly a generic build manual covering a large range of bikes, None of which looked exactly the same as mine. I was quite dissapointed as I wanted to just follow step by step instructions to make sure I did it right. It didn’t take me too long to build the bike, Mainly putting the wheels on, Pedals and handlebars. 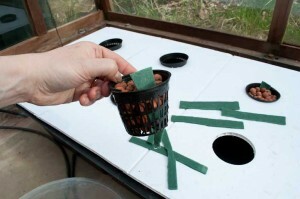 But tweaking it to make it work properly seemed to take ages and quite a bit of frustration. I’m not sure if it was me or what. First of all I couldn’t get the mudguards to stop rubbing on the tires, I twiddled them a lot and finally managed to get them so they weren’t rubbing. 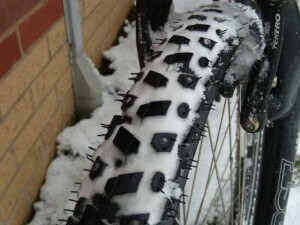 I guess that’s one of the things which you have to accept on full length mudguards. That they are awkward to fit. My previous bike only had a little tiny one which clipped underneath the fork and had a lot of distance between it and the tyre, these have only a few millimeters. I’m not sure how long the front light connector is going to last either in any bad weather which is quite often in this country. It is a simple crimp connector which is pushed onto the light but the metal crimp is still exposed to the elements. I’m probably being fussy and at least spares are easily available from Juicy Bike. On the same note I read in the manual for the bike it made a point of saying do not ride the bike in the wet. This made me laugh as I’d never be on the bike in this country if I took notice of that. After reading some more feedback on forums from Juicy Bike it looks like I can happily ignore this information and no one appears to have had any problems with the rain affecting the bike bits. I also noticed that the battery rattled in it’s holder behind the seat, This would become very irritating within minutes on a ride. I was suprised this was still a problem on a new bike as I noticed someone mentioned it a year or so ago on a review so I wasn’t expecting the same thing on my bike. Anyway I put a few sticky pads in front of the battery pack and this stopped the rattle. Probably come back again if the sticky pads get wet which I’m sure they will in time. Neither of the manuals I had refer to how to fit the luggage rack at the back of the bike, which was fine as it looked just a matter of pulling it to the top of the wheel and fastening it to the bolt holes behind the seat. Unfortunately I didn’t receive the bolts to fasten the two bars from the luggage rack to the seat post. As I wasn’t planning on riding the bike that day I rang Juicy Bike the following morning and was sent out the missing bolts the same day. 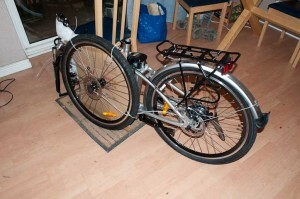 When I received them it was a simple matter of fastening the bars up to put the luggage rack in place. The next thing to tweak was the disk brakes, These were rubbing quite badly on the front and back and took me a long time to adjust properly. It mentions a running in period of 14 miles I think so I left it 14 days after that before adjusting them anymore. At least I know how to adjust them now having never had a bike with them before. After riding the bike back and forward to work a couple of times, I had to adjust the gears properly also as it was rattling and clunking when I change through quite a lot of the gears. 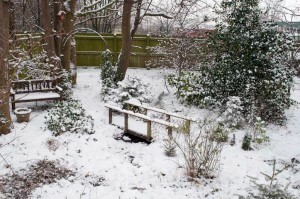 This was compared with my Cyclamatic which never needed adjusting gear wise since day one. So after a couple of frustrating days of setting up I’ve now been riding the bike for a couple of weeks, here is what I’ve found so far. The bike has a little more power than my old bike which is nice when climbing up the hills and the battery life is about the same I think. I can do approximately the same distance as before which is 17 miles on my journey and includes a large long climb. 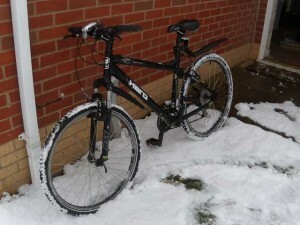 The bike has three levels of power assistance but I’ve just left mine on the most power which equates pretty much to the same power of the old bike, Maybe in the summer and I don’t want to get to work as quick I’ll use less assistance. Having the lights built in is quite cool as they can be turned on and off from the handlebars and give a little extra visibility at any murky time. I’m assuming they are legally suitable for the uk but not too sure. I’ll probably use an extra light at the same time when it get’s dark on my ride home again next winter. It is more rattly and noisy than my Cyclamatic, The rattling is simply the long mudguards which is understandable and preferable than getting muddy wet legs. The motor seems slightly more noise when under strain and low speeds, I can’t really tell any difference when going at any speed though. 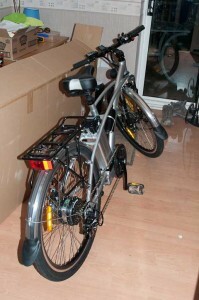 The handlebars cannot be adjusted in height, But can have the angle adjusted. This means I cannot adjust the handlebars to my ideal position. To be fair I knew this might be the case as my Cyclamatic had the same problem as the Juicy Bike Sport. I will probably invest in some form of stem extender on this bike to make my journey a little more comfortable. It’s a little too early to say how happy I am with the bike, but so far so good and hopefully the bike will last as long and be as reliable as my Cyclamatic. I think the most important thing which Juicy Bike could do though is produce a nice construction and user manual specifically for this bike. Having written manuals as part of my work I know how important this is and how a badly produced one just makes the customer frustrated. Which was me in this case. If you fancy having a go on an Electric bike and maybe purchasing one I’d recommend visiting them to have a look at one for yourself first hand, I know first hand they are a friendly bunch.